This project offers you the chance to work on enrichment with captive orangutans and sun bears at the world-renowned Samboja Lestari Rescue Centre. Samboja Lestari is an area of restored tropical rainforest near the city of Balikipapan in East Kalimantan, Indonesian Borneo. Established by the Borneo Orangutan Survival Foundation (BOSF), this 2,000-hectare orangutan sanctuary was created with the aim of providing a safe haven for rehabilitated orangutans, whilst at the same time providing a source of income for local people. Since 2001, the surrounding area has been planted with more than a million trees covering more than 1000 different species. With the growth of the forest, the density and diversity of wildlife returned. So far 137 bird species and nine primate species have been recorded. Several Forest Schools built here provide natural, educational playgrounds for the orangutans, in which they are able to learn vital forest skills in the hope of someday being able to be returned to the wild. Elsewhere, many orangutan islands have been created to accommodate those orangutans which may be suffering from disabilities, preventing them from ever being release into the wild, whilst others are used to prepare suitable candidates for their release! What's more, there is an area designated solely to house a population of over 50 sun bears and volunteers spend time working with the bears too. As a volunteer on this project, you will help rehabilitate Samboja Lestari's orangutans and sun bears by assisting in a range of activities such as enrichment, husbandry, and sanctuary upkeep. Each year since 2012, the foundation has been able to successfully release a number of orangutans, and your work as a volunteer will help ensure that more orangutans can continue to be released back into their natural forest home. Your main activities whilst volunteering with orangutans at Samboja Lestari include husbandry, enrichment, reforestation, maintenance and construction work for both the orangutans and the sun bears resident here. You will be treated as pseudo-staff whilst on the project, meaning full participation in all of the centre's work. You’ll head over to the orangutan islands to observe these great apes and collect vital behavioural data on them whilst also monitoring their health and general well-being. You’ll do this by completing a circuit of the islands on a small boat, offering a great chance for some beautiful photographs. Just make sure not to drop your camera! Whilst on the project you will have the chance to create enrichment to stimulate and benefit the orangutans resident here, whilst also helping to encourage natural behaviour. Creativity is encouraged here, so if you have an idea which you think the apes would enjoy please put it forward! You will also be preparing the food and delivering this to the orangutan islands. Some of your time will be spent cleaning the orangutan enclosures and the fruit store where food for the orangutans and sun bears is prepared. You will also take part in leaf collection (for the orangutans to build their nests) and this will involve regular treks out into the jungle - make sure you have packed your walking boots and are ready to really get stuck in! You will be able to work within the sun bear area during your time here, where around 50 sun bears reside! Volunteers help with general enclosure maintenance and the enrichment of these magnificent bears - one of the world's rarest and smallest bear species. You’ll be helping with construction and repair work, two on-going tasks at the centre and ones which always require volunteer assistance. You could be involved with the maintenance of the rainforest environment, building/maintenance of platforms on the orangutan islands, or the upkeep of the sun bear enclosures, to name but a few examples. As a popular part of the volunteer experience, you will have the opportunity to walk high up in the forest canopy, keeping your eyes peeled for all kinds of flora and fauna. You may even spot a pair of singing gibbons, if you’re lucky! This is a fantastic way to appreciate the diversity of the Bornean jungle – you won’t forget this experience in a hurry. An afternoon centred around relaxation is spent on the Black River. You will board a local boat and travel along the winding river in search of the endangered proboscis monkey, famous for its oversized nose. During your journey you will travel through a local fishing village, which will offer you the chance to see how local people live, and you'll travel briefly out to sea to watch the sunset. During your stay, you will have the opportunity to visit the local night market. Why not take this opportunity to enjoy some local Indonesian cuisine? With plenty of options to go around, you'll be spoilt for choice. Please note, your itinerary will depend on the requirements of the project and is subject to last minute changes due to weather or ground conditions. Below is a sample two-week itinerary, however, if you are joining the project for a one week duration, please click here to view an example of a 7-night itinerary. Upon arrival into Balikpapan Airport, you will be met by a member of the team and transferred to the project site at Samboja Lestari. After settling in, and perhaps having your first glimpse of the centre's orangutans, you will enjoy dinner and an orientation from Kate, the volunteer coordinator. After breakfast at the lodge you will climb the on-site fire tower, where you will enjoy an incredible view and see all areas of the centre. In the afternoon you will take a trip to head office to meet the staff, before enjoying dinner in the evening and learning all about the history of Samboja Lestari. Today you will begin your project work by creating enrichment for some of the 200 resident orangutans and collecting leaves and branches for them so they can build their nests. If there's time, you may also get involved in food prep for the animals. After breakfast you will walk to the sun bear enclosures as you prepare for a day working with these incredible animals. You will spend today feeding the bears, cleaning their enclosures and creating enrichment for them. In the afternoon your construction skills may also be tested! Today you will be able to spend a full day in the city of Balikpapan. You can visit the local craft market, try some local food or simply buy anything you may need for the week ahead from the local shopping mall. You will also enjoy a nice lunch as a group with the volunteer coordinators. Today will be another orangutan day, and to ensure the great apes remain stimulated you’ll be making a different type of enrichment for them. Afterwards, you will be able to give the enrichment items to the orangutans and see what they make of your work! Tonight you will visit the local night market and we recommend trying some of the amazing street food whilst there! This morning you'll be helping with any current construction projects, such as building platforms on the orangutan islands. Then, in the afternoon, you will be creating enrichment for the orangutans in an area which overlooks the orangutan islands, offering another great opportunity to observe them. Today you will have a relaxed morning off which you can spend as you like (a lie-in may be needed)! In the afternoon, you will go on a fantastic boat trip along the Black River. This is a great opportunity to see the iconic proboscis monkey, so make sure you bring your camera along with you! The orangutans will be your priority today and you’ll spend your time thinking up creative enrichment ideas for these clever apes, as well as gathering branches for nest making. If any construction needs completing at the project site, then it will be all hands on deck too! You'll begin your day either working on enrichment for the orangutans or on a small construction project. In the afternoon, you'll be off on an adventure as you go on a canopy walk in the rainforest! You will have the opportunity to walk high up in the forest canopy, keeping your eyes peeled for gibbons and learning about the native flora and fauna from the project staff. These will be your final full days at Samboja Lestari, and you will spend your remaining time working alongside the orangutans. You will continue to create enrichment for them and, if you have not yet had the opportunity, you will take a small boat around the islands to distribute food or enrichment items. This is a great opportunity to see the orangutans up-close and to take some amazing photos! Your final evening will be spent with your group and the project coordinators, as you watch a slide-show of your stay and enjoy a few drinks if you wish. Sadly, today will be your final day and after saying goodbye to the rest of your group and the project staff, you will take a transfer back to Balikpapan Airport in time for your flight home or to continue with your travels. Important Information: This project is extremely popular, with dates getting fully booked up to 6 months in advance. We therefore recommend that you secure your place as early as possible to ensure you can join on your preferred start date. Select a duration below to see the available start dates. All dates shown are currently available for you to join this project but please be aware the project only runs between March and October. At the Samboja Lestari Orangutan Sanctuary, one of Indonesia's most prestigious and renowned orangutan rehabilitation and rescue centres, and one of the main focal points of BOSF ('the Borneo Orangutan Survival Foundation'), the emphasis is on the rehabilitation and release of orangutans, many of whom were rescued from atrocious situations. The overriding goal is to reintroduce orangutans back to secure natural habitats in order to establish new viable long-term populations to bolster the conservation of the species in the wild. A number of orangutans have been already been successfully released by BOSF so please keep an eye on our blog for any further release stories. Every year since 2012 the team at the sanctuary have been able to release orangutans back into the wild, and the help that volunteers provide in helping the sanctuary to run is crucial to this process. Sadly, some of the orangutan residents here cannot ever be released back into the wild because of injury or illness. For these orangutans, the sanctuary provides them with a safe haven where they can live out the rest of their lives away from the threat of deforestation and human destruction. The sanctuary also includes a large area put aside for the 50 + sun bears living here. These bears have all been rescued from the illegal pet trade or from areas of major deforestation. An Update From Samboja - The New Sun Bear Enrichment Area Is Open For Business! We have a wonderful weekend update for you today - the team at Samboja Lestari are happy to announce the opening of their brand-new sun bear enrichment area! See how the team (and our volunteers!) worked to create this exciting new area for the sanctuary's adorable animals by checking out today's blog post. Accommodation during your time on the project will be in twin-share rooms at the Samboja Ecolodge where all of the interior and exterior walls are built out of recycled materials! Each room comes equipped with fully working air conditioning, mosquito nets and an en-suite bathroom, with cold water and a western-style toilet. Please don’t worry about being too cold in the shower as it is very hot and humid here all year round, so you will most likely welcome the respite! You will have three meals per day provided for you whilst on this project. Breakfast is a variety of cereals, eggs and rice/noodle dishes alongside fruit and fresh fruit juice. Lunches and dinners typically consist of noodles or rice with chicken, seafood, mutton or beef and vegetables. Tofu and Soy bean dishes are also provided for vegetarians and each meal is served as a buffet. The work undertaken on this project will involve physical labour, often in humid conditions, so a moderate level of fitness is required. No skills or experience are required; all that we ask is that you arrive with a commitment to the project and its aims, a passion for wildlife conservation, and the willingness to work alongside your team! To volunteer on this project you must have Hepatitis A and Hepatitis B vaccinations, as well as an HIV and HCV test (to check for Hepatitis C) before arrival. A chest x-ray or skin test will also need to be provided to prove that you do not have Tuberculosis. Alternatively, if you have previously had a BCG injection and can provide proof of this, that will also suffice. This is ESSENTIAL, as without the above you will not be granted access to the volunteer areas on site. That is not to say that as a volunteer you will have no interaction with the orangutans, it simply means that you will have no direct contact with them. You will still observe them on a daily basis and see how your contribution to their husbandry and enrichment makes a real difference in these great apes’ lives. For more information please view our article on hands on contact with orangutans here. This project runs between March and October, which avoids the rainy season and as it is based at a rehabilitation sanctuary, there are orangutans and sun bears here year round, so there is no real preferred time to volunteer. You will need to fly into Balikpapan Airport on your project start date, arriving between 9am - 5pm, with most international flight routes going via Jakarta International Airport (Soekarno-Hatta International Airport). Upon arrival into Balikpapan Airport, you will be met by a project representative in the arrivals hall who will then transfer you to Samboja Lodge. This transfer takes approximately one hour. If you arrive a day early, and stay in a hotel close to Balikpapan Airport, we will be able to arrange your transfer to Samboja Lodge from there. Please let us know if you would like any suggestions. To join this project, you will need a tourist visa which you can get on arrival into Indonesia. The cost for this visa is approximately US$35. If you plan to stay in Indonesia for longer than 30 days, you can get a 30-day tourist visa on arrival and then extend your visa for a further 30 days by taking a trip to an embassy while in-country. Alternatively, it is possible to arrange a 60-day social/cultural visa in advance of your arrival and we can provide you with the correct documents to support your application. We advise that you speak to the embassy in your country to see if there are any requirements for travel. Please note that your passport must be valid for a minimum of six months from your date of entry into Indonesia. We never expected to be so close to the animals, so regularly. Every time I looked into an orangutan's eyes, it melted my heart. The boat trips we took, took my breath away, and the whole experience was greater than I had ever imagined. My recent visit to Samboja Lestari was my second time at this amazing project. For me personally, spending time with the orangutans is something that can’t be explained; it needs to be experienced. From start to finish, Kate, Wik and Sam make sure your days are full of varying activities and make you feel so welcome. All of the support staff, both at the lodge and at work, are so friendly and helpful. It’s like a home away from home. I can’t recommend this trip highly enough. I’m already looking to go back for a third time!!! I'll Be Going Back Again And Again! My favourite memory was putting up a hammock we had spent time making in the week for the baby house, and then seeing a baby orangutan playing and laughing - very happy with their new hammock! I had an amazing time - again! I'll be going back again and again! This Was My Third Trip! This was my third trip and, as a returnee, I was worried that I might be underwhelmed...but I was more impressed than ever. I can't speak highly enough of Kate - she has such vision, determination and commitment to the work, and has an unmatchable ability to motivate and cohere the volunteers. It is hard to imagine there being a more effective, harmonious and friendly team that Wiwik, Sam and Kate. All the volunteers learnt so much from them, and the level of mutual respect is very heartwarming and restores my faith in humanity. It's very fulfilling to work as a volunteer. My most quiet and moving moments came when I was watching an orangutan, Jonas, in his cage: when he looks you in the eye, he puts life's 'big questions' to you! A Perfect Mix Of Order, Humour And Lots Of Fun! I Wish I Didn't Have To Leave! Kate was brilliant. Her energy and enthusiasm brought our group of strangers together to make a real team and forge new friendships I will never forget. The structure of the programme is top notch with balance on hard work, orangutan time and rest time. I loved every minute...even the digging in the rain! I hope to make it back again in the next few years. Everything Was Fantastic - I Can't Fault It! The project is really well-organised, with a perfect balance of hard graft and down-time, including trips to local markets, treetop canopy walks, and boat trips down the Black River. I honestly couldn't pick just one favourite moment: every close encounter with the orangutans and sun bears was incredible. The project work was really varied, which was great, and the other volunteers were fantastic. There Were So Many 'Catch Your Breath' Moments! This trip was amazing, from hearing the jungle sounds and the orangutans for the first time, through to the last evening where we were all moved to tears watching project videos, seeing the passion and dedication of the staff, and feeling a real sense of achievement for the work we had been involved with. The first time I looked in the eyes of an orangutan was a very emotional moment for me. I remember very well what was in my mind in that particular moment: orangutans are like us, but pure. We share 97% of their DNA, and in the 3% mission, there seems to be no space for the bad. It's Hard to Pinpoint a Favourite Moment! It was fantastic getting to see the individual personalities of all the orangutans. I loved every minute of it. We were lucky enough to be there when 10 orangutans were heading off to a new forest school, which would put them one step away from being released - it was a moment I will never forget. I thoroughly enjoyed my time at Samboja Lestari; Kate the coordinator is just fantastic and so well organised. You couldn't ask for a better leader. The rest of the staff were just amazing as well - to see the love and passion they have for the orangutans is beyond words. I loved it so much, I'm sure I'll be back again! I loved everything! I guess if I had to pick a favourite memory, it would be when we were so close up to an orangutan for the first time, looking into his eyes and being overwhelmed by the wisdom he seemed to have. Making the decision to become a volunteer for a cause you have supported has to be the most rewarding type of support a human can offer. I started volunteering through The Great Projects in October 2016 and couldn't wait to go back. Seeing the progress from just 6 months ago was - to say the least - mind blowing, knowing that all the effort you put in as a volunteer actually is valued and serves to make huge, and I mean HUGE changes! Whatever tasks we were given, I found myself being immersed by this tremendous urge to be involved with all my heart and soul...you can't help that. You hear the sounds of the orangutans constantly calling out. It surrounds you. 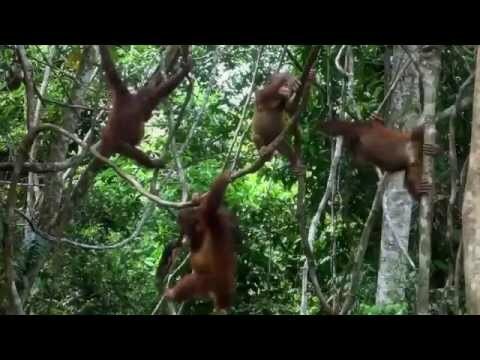 You see the orangutans enjoying their freedom on the islands that have been designed to create freedom and comfort for them as they await full release into the forests. It's there, it's real, it's awesome! You become part of this wondrous move to save the now critically endangered orangutan...I will always be involved, I will go back again, and I urge you to do the same. It is hard to choose just one favourite moment, as the whole stay was just a wonderful and enriching experience. Being able to spend so much time observing the orangutans and helping to make their life at Samboja as natural as possible in a group of like-minded people has been one of the best experiences ever. I would like to give a big thank you to everyone at The Great Projects, from the staff here in the UK and particularly to Kate and her team on location. Kate is an incredible person and plays a big role in making this such an amazing experience. My favourite memory was probably seeing the orangutans on the islands from the small boat. The boat trip down the Black River was also brilliant! Kate, Sam and Wiwik were excellent - they work so hard, are so motivational, and are great fun, always smiling! Everything Was My Favourite Part! The volunteer coordinator and all the others working on the project were amazing and do a fantastic job of making you feel welcome. Couldn't have asked for any more than they gave. The Borneo Orangutan Survival Foundation (BOSF) is an Indonesian non-profit organization dedicated to the conservation of the Bornean orangutan and its habitat, in cooperation with local communities, the Indonesian Ministry of Forestry and international partner organizations. Renowned for its incredible rainforests and unequalled, natural diversity, Indonesian Borneo is an enchanting and verdant travel destination. Due to its amazing collection of native species, Borneo is also at the forefront of the responsible travel and international volunteering revolution. The lush, green vistas and fascinating tribal cultures of this island – both the Indonesian and the Malaysian side - make it one of the most interesting and visually stunning places to visit in the world. Kalimantan – Indonesia's portion of Borneo – makes up 73% of the island's landmass. The least well known and visited of Indonesia's provinces, Kalimantan has much to offer the intrepid traveller. With stunning mountain ranges, forests and mighty rivers stretching across the interior – Kalimantan is perfect for those looking for adventure and then some. With a rich culture, fantastic beaches, and world class national parks – Kalimantan really is somewhere that is rife for exploration. What's more, with little effort you can come face to face with wild orangutans, macaques, proboscis monkeys, an exotic array of bird life and maybe even a sun bear or two! After your project, why not join up with the Komodo Dragon Adventure Tour and extend your stay by seeing some of the most spectacular caves, beaches and wildlife!